This one is all about tracing: tracing off the pattern, chalk tracing the pattern shape and markings onto the fabric, and thread tracing the sewing line onto the fabric pattern piece. When I last worked on the project, I was figuring out the best way for me to get rid of the 1/4 inch seam allowances on the Kwik Sew paper pattern in preparation to tracing the sewing line. It turns out that the easiest way for me was to use a double tracing wheel. Here are my steps, posted previously, for tracing off a flat paper pattern piece from the given "place on the fold" tissue pattern piece, now edited for use with the double tracing wheel. Edits are in italics. There are many ways to create a full paper pattern piece from the tissue paper half piece original. This is where I thought I'd post a link to someone else's tutorial. But I couldn't find one for the method I use! 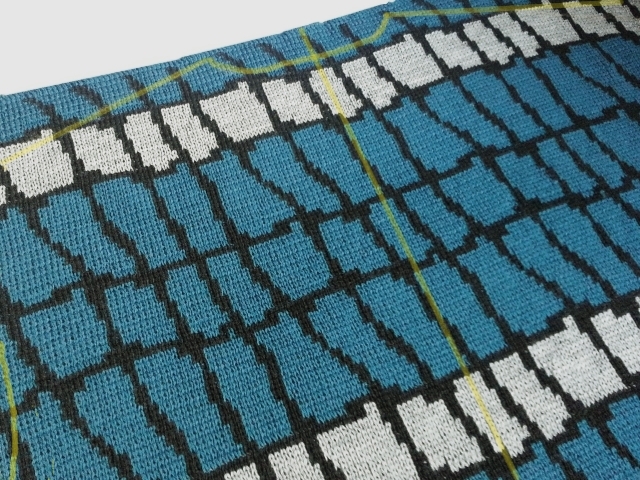 If you've traced off any patterns, making a full piece from a half is probably intuitive. The way I do it uses banner paper, pieces of carbon paper, and (if seam allowances are included in the pattern) a double tracing wheel. First, I fold the banner paper as if it were a piece of fabric and place the tissue pattern piece I'll be tracing on top. I fold pieces of carbon paper in half, shiny side out, and slip the carbon paper between the two sides of banner paper, wherever I need to trace a line or notch or other mark. Using the double tracing wheel I then trace along the printed pattern lines and marks of the tissue paper. The outer wheel traces along the printed cutting line; the other wheel, adjusted to the width of the seam allowance, automatically traces the sewing line. [I use] a ruler to make the straight lines quickly, going freehand and a bit more slowly around the curves. Last, I cut the banner paper on the sewing (inner) line and I'm left with a nice sturdy flat pattern piece without seam allowances. I'm almost ready to outline the pattern piece onto the fabric with chalk, but first I place registration lines on the wrong side of the prepared fabric with chalk. My new favorite marking tool for medium or dark fabric is the Chaco Liner , but I'm using regular tailor's chalk this time, because the tailor's chalk line is thicker and shows up more. Here I've marked the center back of the cardi only. The lines I draw will really depend on the piece I'm about to cut and the fabric pattern. 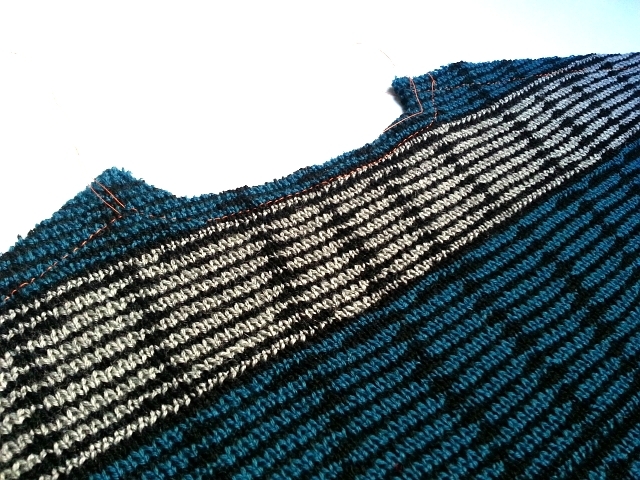 The stitches in sweater knits are usually big enough so that you can easily see the wale (column of stitches) to mark. If there wasn't an obvious horizontal design element, I'd also chalk in some horizontal lines. Next I carefully place the paper pattern on the fabric, secure it with weights, and trace the outline of the pattern piece onto the fabric with chalk. In this case the line indicating the "grain of the fabric" is parallel to this vertical chalk line. You can see part of the Back in the pic below. Chalk lines have been digitally enhanced, because they were rather invisible in the pic, even though I used the tailor's chalk! Next comes the thread tracing of the chalk sewing line. If the fabric had been unstable, I wouldn't have made the chalk line first. I would have gone directly to thread tracing with the paper pattern still in place, skipping the chalk line tracing altogether. This double knit, however, is relatively stable for a sweater knit, and so I'm comfortable removing the paper pattern and thread tracing along the very outer edge of the chalk line. I find this way easier, though I'm pretty sure I'm breaking some rule. Actually, I don't know anyone who thread traces knits regularly, but I tried thread tracing once, and now I can't go back. There are lots of excellent tutorials online on thread tracing, so I won't get into the details here. 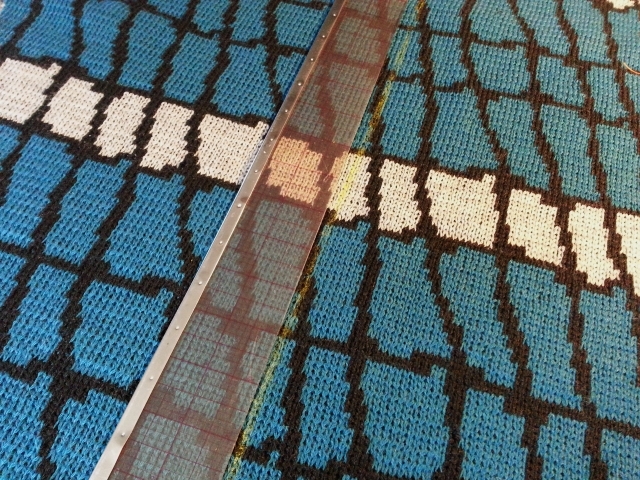 My main reason for thread tracing is to make the sewing line visible on each side of the fabric. I don't use a special thread; I just use the same polyester thread that I use to sew the sweater but in a contrasting color. I do test the thread with a scrap first to make sure the thread can be removed easily. I aim to not stretch the fabric as I work. Next, I cut the fabric. I don't have to be extremely careful about the size of the seam allowance, because the sewing line is marked. I'll be trimming the seam allowance when I do the stretchy Hong Kong finish, so everything will be nice and neat... eventually. 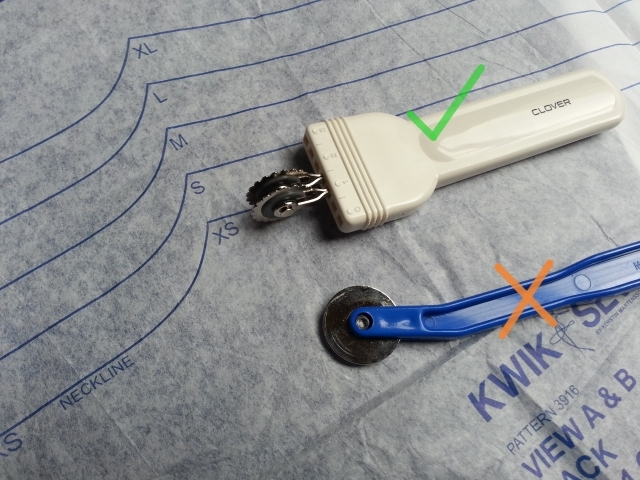 Any sewing rule you regularly break because it works for you? I'd love to know! Disclosure: I received Kwik Sew 3916 for free with a coupon I received at a McCall Pattern Company event.